During the first San Diego Ferguson response rally upon the news of no indictment of the officer who killed unarmed black teen Michael Brown in Ferguson, Mo. City Heights residents practiced their amendment rights by marching the streets and peacefully occupying the North Bound 15 freeway. When the group led back to University avenue, they were given a disperse order to proceed east bound on University Avenue. As we were heading east as, it was then, dozens of protesters were met by a line of police officers linked by arms heading westbound in our direction and starting hitting protesters with batons. Dozens of protesters were met by a line of police officers linked by arms heading westbound on University and starting hitting protesters with batons during the first San Diego to Ferguson response rally. It was then where protestor Emmanuel Wimer, 24, as seen in the following video and news story on November 29th by ABC10, was brutalized and carried out by almost a half a dozen cops. 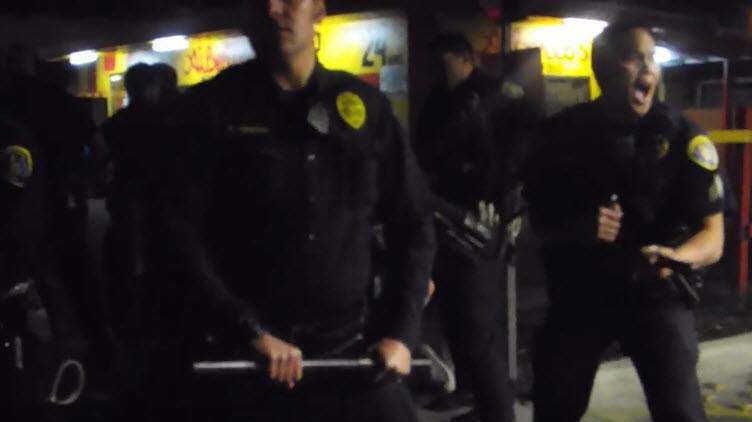 In this video, its clearly shows officers heading westbound on University Avenue using batons against peaceful protesters and independent press. Furthermore, along with him, 3 or 4 legal observers were also arrested that night. SAN DIEGO – One of a handful of people arrested in the local Ferguson protests is out of jail and speaking out. Emmanuel Wimer, 24, says he was unfairly targeted by police in City Heights. In October, he spoke out at a rally against police brutality. Then on Tuesday, he marched with hundreds of local Ferguson protesters in City Heights. 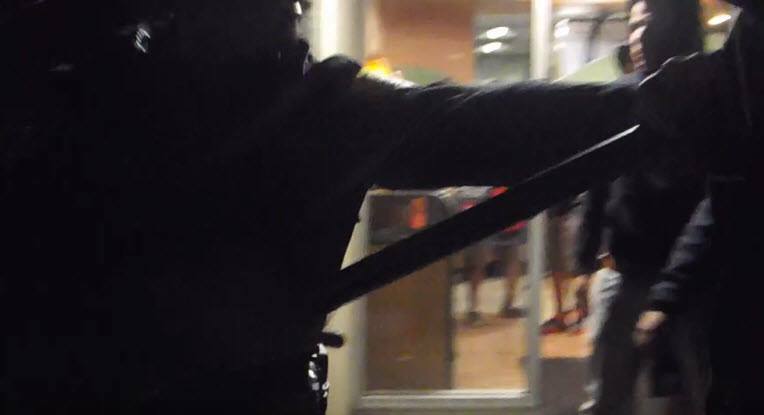 He says he was following the chants of everybody else, when he drew the attention of a group of officers near the Jack in the Box restaurant on University Avenue. In the lockup, Wimer says an officer came up to him and identified himself as the arresting officer. Wimer was arrested along with 3 or 4 legal observers that night. Video does not lie, and it is clear that Zimmerman is taking every route possible to protect the SDPD officer in question and is not honoring the community’s request in being transparent and accountable. As a community, we have proposed with allies for the City to adopt an Independent Community Review Board on Police Practices, demanded justice for Victor Ortega, killed by Officer Jonathan McCarthy and all of the lives stolen from us by every branch of law enforcement. https://uaptsd.org/victims/victims-murdered-by-sd-law-enforcement/, yet, there is still no word on our demands for the hundreds of families affected by the inpunity of San Diego Law Enforcement and Zimmerman upholding the Blue Code of Silence. We deeply appreciate Voice of San Diego’s efforts in thorough investigation and reporting for San Diego residents.